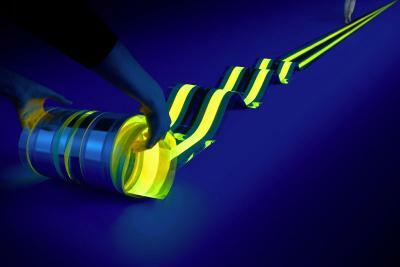 The Fraunhofer FEP announced that it developed a new technology to produce ultra-smooth polymer films. The new technology can be used to produce low-defect density films in a roll-to-roll based process, suitable for a wide range of applications - including encapsulation films, touch layers and as OLED substrates. This technology was developed as part of the EU-funded OptiPerm project. The Fraunhofer researchers say that this new innovative process does not require any special processing environment and could be used under standard factory conditions. In 2016 the EU launched the PI-SCALE project, which established a European-wide roll-to-roll flexible OLED lighting pilot production line, with an aim to enable companies of all sizes to quickly and cost effectively test and scale up their flexible OLED lighting concepts. 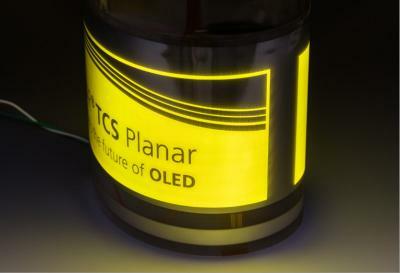 Now the EU has launched a €14 million initiative within PI-SCALE called LYTEUS, which provides the expertise and capability required to progress an OLED lighting concept from an idea and into a commercialized product. Lyteus helps companies with sheet-to-sheet and roll-to-roll prototyping of flexible OLEDs, technology transfer, device encapsulation and more. At launch Lyteus serves four customers: Audi, Rehau, Emde and Pilkington, to develop flexible OLED lighting products in the automotive, aeronautics and designer luminaires sectors. Taiwan's ITRI institute says that recent advances in OLED materials and production methods has enabled it to greatly reduce OLED lighting production costs. Recent technical achievements at ITRI include a new flexible substrate transfer, R2R production process integration, and soft light source system design. In 2016 ITRI constructed a pilot roll-to-roll production line for flexible OLEDs. ITRI now says that these technical achievements will enable it to increase the production line capacity for 50,000 monthly panels. 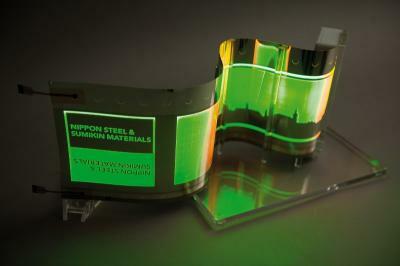 ITRI also developed a new flexible OLED that weighs only 10.7 grams and is less than 0.5 mm thick. The SOLEDLIGHT (Solution Processed OLEDs for Lighting) project was launched in 2015 by a European consortium with an aim to develop cost efficient, roll-to roll (R2R) solution processed OLEDs, including their integration in prototype multiple-panel OLED lighting systems and luminaires. The SOLEDLIGHT consortium (which is coordinated by the University of Valencia and includes OSRAM and Solvay) reported that it managed to develop multi-layer R2R solution processed OLEDs that achieved a power efficiency of 20 lm/W. This is still not up to par with evaporation-based OLEDs, but the project partners aim to achieve 100 lm/W (and 15,000 hours) by the end of 2017. In March 2016 the EU launched a new project, called PI-SCALE, that aims to create a European-wide pilot line which will enable companies of all sizes to quickly and cost effectively test and scale up their flexible OLED lighting concepts and turn them into market ready products. PI-SCALE members started to produce sample panels - and can currently make long films up to 10 meters in size. You can see such sheets (cut to 1.8 meters) in the video above, taken at SID DisplayWeek. The National Centre of Flexible Electronics (FlexE Centre) at the Indian Institute of Technology in Kanpur announced that it assigned UK-based RK PrintCoat Instruments to manufacture and supply a bespoke roll-to-roll (R2R) pilot line that will be used for R&D and prototyping projects in the field of printed and flexible electronics. The National Centre for Flexible Electronics (FlexE) was established in 2014 at the Indian Institute of Technology in Kanpur, with an aim to bring together Indian academia, industry and public research organizations for research and development of large area flexible electronics. The FlexE center develops OLED lighting and OLED signage applications and is collaborating with industrial partners in both fields. The center explores evaporation, printing and hybrid processing for OLED production. 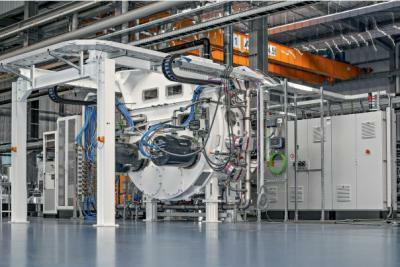 Von Ardenne announced that the company developed an innovative machine to process flexible glass. The FOSA LABX 330 Glass enables a roll-to-roll glass coating process. This first of its kind machine was developed as part of the German KONFECT project, launched in 2015, together with partners Fraunhofer FEP, Schott and Tesa. Von Ardenne now says that it intends to intensify its cooperation with the Fraunhofer FEP in the flexible glass coating field. The Fraunhofer will present coating samples of glass produced using the new machine for the first time at LOPEC 2017.